Sergey Khudiev speaks on why severing the Eucharistic communion with Constantinople is the only right thing to do in this case (according to the author). The tragic schism in world Orthodoxy, which we are witnessing now, causes a completely natural and understandable feeling of bitterness and protest. It should not be this way, the abhorrent strife of this world should not manifest itself in the Church, which is the Kingdom of God’s outpost and embassy, and the testimony of the future world where there will no longer be geopolitics, quarrels, and enmity. This Church is getting torn apart by the quarrel, which clearly translates into the break of the Eucharistic Communion. This cannot but cause deep sorrow and irrelevance of what is happening. Of course, it is a dreadful testimony of the Gospel to the outside world. The decision to sever the Eucharistic Communion with the Patriarchate of Constantinople is a very hard one. Trouble is, it is impossible to avoid making hard decisions sometimes. I have some personal experience in this regard. I worked in a Christian library some twenty years ago. We met a man, who made the most favorable impression on us with his sociability, eagerness, and real zeal for God. At first, he volunteered to help the library, and then we hired him. However, after a while he began to exhibit his not so pleasant traits: captiousness, rude imperiousness, inability and unwillingness to listen to other people. He believed that serving God should not allow carelessness or lack of diligence. Soon the atmosphere became very somber. How did I react? Exactly as recommended by the Holy Fathers: I humbled and reproached myself, asked for forgiveness, regardless of whether I felt guilty or not, and ceded in every way. I am not a competitor by nature and I do not like conflicts: it is always easier for me to remain silent and hope that everything will resolve itself. This would be perfectly fine in the vast majority of situations in the Church, and even beyond it while dealing with most people. Yet, not in this case. That man without meeting any resistance stepped up his claims turning the library into some analogue of a totalitarian sect. He knew the Christian rhetoric in detail and assured us that he was zealous for the work of God and the salvation of souls, including ours. Fortunately, our library had a book by Edin Lovas, the Norwegian missioner, called “People in Power: Ambition and the Church”, which precisely described our situation in surprisingly similar details. As Lovas wrote, Christians easily become victims of people striving for power specifically because they do their best to be good Christians: humble, loving, patient, and forgiving. Finally, the inadequacy of our employee’s claims stepped over the line, and he got fired with a tough, shameful, and ugly scandal that was a strain on our nerves. Yet, I had to go through it: the scandal, the rupture, and extremely unpleasant things that I do not want to talk about in detail now. For there are situations when one has to do it. The thing that I regret even now is that I did not do it earlier: it would have somehow minimized the damage that could not be avoided anyway. Why am I telling this personal story? The thing is that it illustrates the bitter experience of life in this fallen world: giving in to someone else’s love for power, you do not find peace. You encourage them to press on. You may not like Patriarch Kirill of the Russian Orthodox Church in general. However, he is not the one who claims the title of the First Hierarch in the Universal Church, “First Without Equals”, who has the power to interfere in other Patriarchates’ affairs without their permission and against their will. Constantinople is the one that brings such claims. It is not as if it happened out of the blue: the claims to exceptional status were brought before, which certain theological constructions were built for. However, it was more about words. 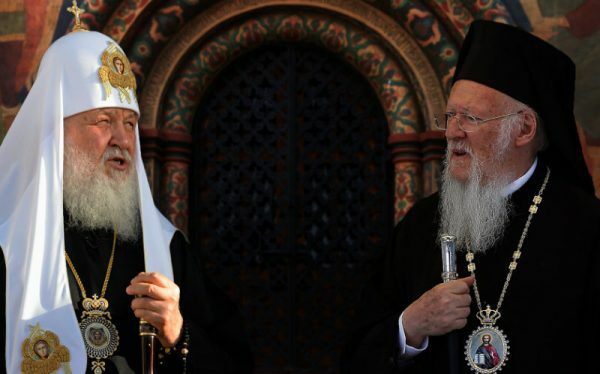 The Moscow Patriarchate cautiously expressed disagreement, conducted theological discussions, and tried to avoid the escalation of the conflict. Alas, the time has come, when it is impossible to do it anymore. Is it possible, maybe, to renounce the claims of Patriarch Bartholomew, but preserve the Eucharistic Communion? Well, I understand and sympathize with this question. After all, the Eucharist will continue to take place in the churches of the Ecumenical Patriarchate of Constantinople even though the Patriarch behaved this way, won’t it? God’s grace will not disappear, as if someone has shut the valve off, will it? No, it will not. God will not deprive ordinary priests and believers of His grace, who concelebrate the Eucharist with reverence, faith, and fear of God on account of the hierarchs’ sins. A similar question in the Church’s history was raised following the Donatism: it was decided then that the hierarchs’ sins do not deprive ordinary believers of the grace. The problem is of another kind. When you take Communion at the service in a community, you thus express your full agreement with everything that is proclaimed at this service. For example, I suppose, the Catholics officiate the Eucharist and God accepts it according to their faith, but I could not take Communion in the Catholic church. For it is necessary to recognize the Pope (at the service) in the sense, in which he is recognized by Catholics: that is, not just as a respected Christian leader, but as the head of the Universal Church. I would not be able to do that quite sincerely: participating in the Eucharist would be wrong having serious reservations about it. Eucharistic communion is that sign of unity that is lost in this case, unfortunately. As it is lost in the case of Constantinople, the Second Rome. There are quite sad, but inevitable things in our life. When someone claims spiritual authority over you, you may either accept these claims or reject them. We cannot accept Fanar’s claims. All that remains is to say “no”.